Combine coconut cream and milk in a bowl. Pour 1/2 the mixture into a wok and cook over high heat for 6-8 minutes or until oil begins to separate. Add curry paste and cook for 2 minutes or until fragrant. Add pork to wok and stir-fry for 2-4 minutes or until cooked, then add remaining coconut mixture and bring to the boil. Stir in sugar, fish sauce and torn kaffir lime leaves. Simmer for 2-3 minutes, then add 1/2 the basil leaves. 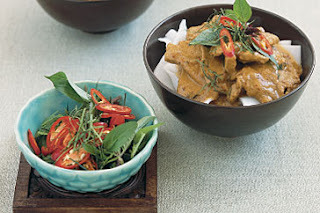 Serve curry scattered with remaining basil, shredded kaffir lime leaves and chilli, on top of rice or rice noodles.